Ballycotton International Transport has developed itself a first class reputation for refrigerated transport all across Europe over the past three decades. Irish Trucker found out all about the Cork-based company and its impressive fleet of modern trucks from director Noel Hennessy. These are heady times for Ballycotton International Transport down in Midleton, Co Cork and simply the Hennessy family wouldn’t have it any other way. Formerly known as Walsh Transport, the company are now rebranded almost 30 years and thriving as much as ever with a modern fleet of trucks which have all been fitted with new tracking systems, while a brand new CHEREAU trailer from International Trailers has also been added to the fleet recently. Indeed things are very much on the up down in Midleton and the plan, according to company co-director Noel Hennessy, is to keep things that way into 2019. Noel is one of three brothers running the company and was able to take time from an increasingly busy schedule to outline to Irish Trucker what they’re all about, what they specialise on and how far they’re willing to go for their clients. “We are based here in Unit 2 Knockgriffin Industrial Estate, Midleton, Co Cork,” explained Noel. Walsh Transport was owned by the trio’s parents and since the second generation have taken over the running of the family business there has been a change in title along with some of the services they provide. Today, Ballycotton International Transport is known as one of Ireland’s leading refrigerated transport companies and is continually growing its fleet numbers in order to keep up with the demand from loyal clients such as Kepak, DSV Global, Total Produce and Dawn Meats. Noel explained that their trucks have recently received a new upgrade with regards to their tracking systems, which their clientele have been delighted with ever since. “We specialise in refrigerated transport to Europe and it’s mainly meat and dairy products that we are moving and pharmaceutical products as well,” he said. Most of the company’s trucks are of the Volvo brand and can been seen travelling all over the country and continent. Ballycotton International Transport has become renowned for the first class service it gives its clients and that’s something which stems back to the roots of the firm, with Noel’s parents having been immersed in the same line of work with Walsh Transport. Now – almost 30 years on since the company rebranded – things are practically moving as well as they’ve ever been for the Hennessys down in south east Cork way. For Noel, it has come full circle. He started out working for his parents and now he’s proudly a director of his family’s company. “Our parents were in this business and that’s how we all got involved in it,” he said. 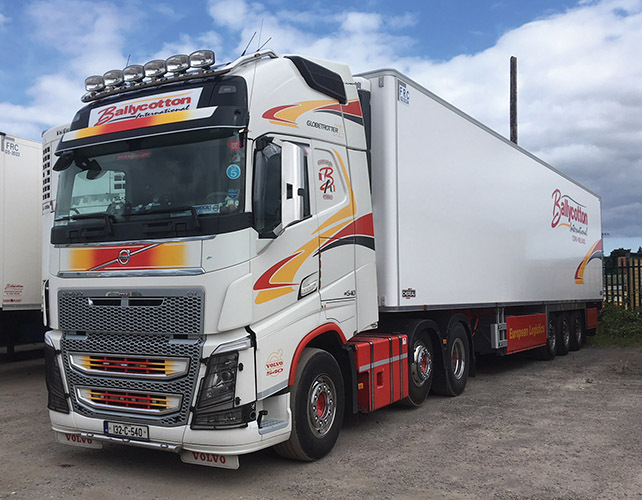 Couple that with the fact that the company is now renowned for its five-star service, and it’s not hard understand why Ballycotton International Transport has maintained its long list of loyal clients down through the years – as well as through the tough times for the industry in general. The secret to success is nothing special as far as Noel sees it but he does acknowledge that it can be a time-consuming business at times, especially when your role is one of three directors. “I just think that we give a good service here. We always have and our tracking systems allow our clients to track their products 24/7,” he said. Of course the fleet at Ballycotton International Transport isn’t the only one the Hennessys will be keeping their eye on moving forward, as the three brothers also operate Midleton Transport from their home town in the Rebel County. “We bought Midleton Transport in October 1997 and outside of what we do in refrigeration, we’d be drawing a lot of fertiliser and grain for Dairy Gold, Gold Crop, McDonnell Bros and Roadstone with this company as well,” said Noel.